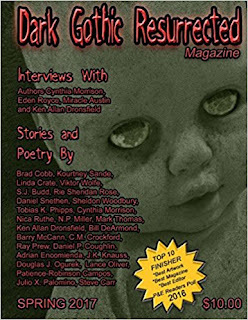 My latest tale, Never Forget Me is out now in Dark Gothic Resurrected Magazine, your got to place for all things dark and creepy! Never Forget Me follows the tale of a young woman who finds herself back in her hometown. The very place from which she fled in order to have a better life. But yet she feels there is something calling her back. One day she stands by her window and sees a ghost. The ghost of the girl she once was and is powerless to resist her call.